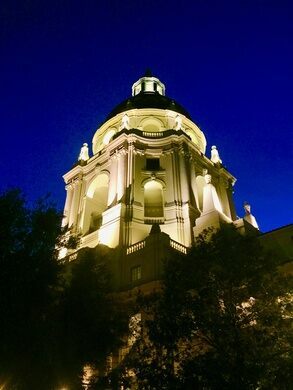 Pasadena’s City Hall has been a favorite filming location for Hollywood ever since Charlie Chaplin used the towering domed structure as the backdrop for scenes in his 1940 satire The Great Dictator. Over the years, films and television shows as diverse as Butterfield 8, Beverly Hills Cop 2, and Parks and Recreation have taken advantage of the production value offered by this 1927 landmark building. 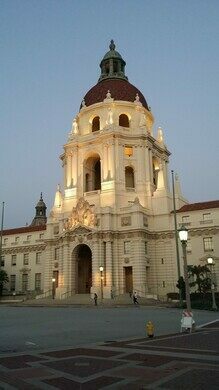 Designed by famed civic architects Bakewell and Brown - whose designs also include San Francisco’s City Hall and the San Francisco Art institute – the building reaches 206 feet into the blue Pasadena sky and covers 170,000 square feet of interior space. 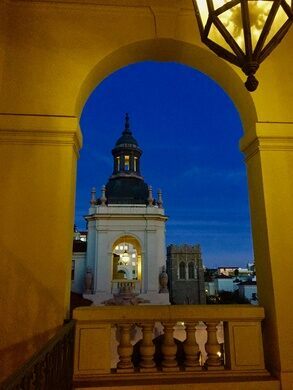 The design is a mix of Mediterranean Revival Style and Spanish Colonial Revival Style, and was influenced by Italian Renaissance architecture. 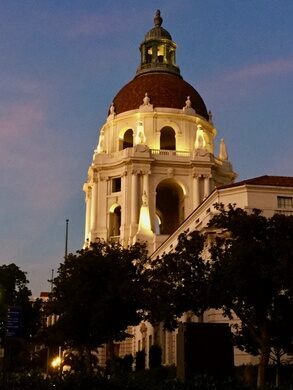 The City Hall was commissioned in 1923 when, with their town booming and its population climbing past 45,000, Pasadena residents voted to build a grand new civic center that would befit the rising status of the Rose City. The building recently underwent a $117 million dollar renovation (3 times its original cost when adjusted for inflation) to protect it from earthquake damage. A landmark for a trailblazer for female architects and the designer of one of the most famous and opulent buildings in California.